Weight gain is a common symptom of menopause. Changes in the body result in a slower metabolism, making it more difficult to build and maintain muscle mass. Weight distribution also shifts, causing more fat to accumulate around the stomach rather than around the hips and legs. What Do Weight Loss Pills, Supplements and Products Promise? Many weight loss products often promise miracles. They claim they'll slim you down in weeks or help you become supermodel slim in no time, without any effort on your side. Most weight loss pills fall into two categories: “fat burners” that promise to increase metabolic rate, or “energizers” that claim to make hunger disappear or give you an extra kick at the gym. There are countless brands out there, but in general, they may as well be promising baby dragon eggs for all the truth there is to these statements. Most weight loss products are either sold as dietary supplements, or as non-prescription drugs. While in order to be classified as safe and put on the shelves, they must undergo clinical trials, the results of these trials are often inconclusive or have had the facts distorted to match expectations. Quality-wise, you'll find anything from empty promises to potential health risks. 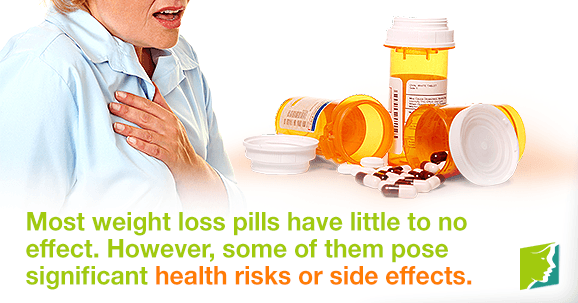 Most weight loss pills on the market have little to no effect, and should be regarded with suspicion. Others pose significant health risks or side effects, or their mechanism of action is nothing like what they advertise. For example, many “fat burners” are actually potent laxatives that may cause immediate weight loss, but it won't be sustainable and could cause dehydration. Meanwhile, the stimulants used to repress hunger are often bad for heart health or mere placebos. Many products that were originally marketed as weight loss supplements have since been removed from the market. For example, Ephedra, a popular weight loss supplement, was found to cause symptoms that ranged from increased heart rate to organ failure and death. This led to a U.S. wide ban on them back in 2004. Before buying any weight loss product, be sure check the Food and Drug Administration's website - any recalls or adverse events will appear there. The National Library of Medicine's Office of Dietary Supplements provides fact sheets on the safety levels of most established weight loss products. It's also a good idea to look for online reviews of products, and consult your doctor, as some drugs may interact poorly with medications you're currently taking. Some women also hire personal trainers, while others subscribe to diet programs that provide them with all their meals for a month. While these programs can be effective for some women short-term, the important thing to remember is that these programs are founded on the idea of you making a core lifestyle change. If you don't commit to that, you may find yourself regaining the weight you've lost. If you're concerned about your weight gain, talk to your doctor. Weight gain can be a side effect of other problems, which your doctor can test for. They may also be able to recommend a weight loss program tailored to your medical history. Click the following link for more information on dealing with menopausal weight gain. Thacker, H.L. MD. (2009). The Cleveland Clinic Guide to Menopause. Kaplan Publishing, New York.